Pulmonary atresia with intact ventricular septum (PAIVS) is associated with coronary abnormalities, including fistulous connections with a hypertensive right ventriculare (RV) cavity. A huge ventriculocoronary fistula results in fetal myocardial ischemia, and early surgical or catheter intervention is occasionally required.1, 2) We report a case of a fetus with a huge ventricular fistula associated with PAIVS, following an immediate surgical intervention after birth. A 22-year-old woman was referred to our institution for fetal echocardiography at 32 weeks’ gestation. Fetal echocardiography showed pulmonary atresia with intact ventricular septum. There was bidirectional flow with systolic retrograde and diastolic antegrade flow in the fistulous vessel. This finding indicated the presence of a ventriculocoronary fistula between the aorta and RV (Fig. 1). We speculated that such a huge ventriculocoronary fistula would lead to coronary arterial steal and perfusion with desaturated blood flow after birth, resulting in coronary ischemia. Therefore, we decided to close the fistula as soon as delivery occurred and planned a scheduled cesarean section at 38 weeks’ gestation. However, a female neonate who weighed 2,028 g was born at 37 weeks’ gestation because of premature rupture of the membranes. Postnatal echocardiography confirmed a huge ventriculocoronary fistula between the left anterior descending coronary artery and RV with a diameter of 7 mm. The oxgen saturation was 82%, and intravenous administration of prostaglandinE1 was immediately started to maintain the ductal patency. Electrocardiography and echocardiography showed no ischemic changes. Closure of the ventriculoarterial fistula was then attempted. At a median thoracotomy, an enlarged ventriculocoronary fistula was ligated at insertion into the RV (Fig. 2). Systemic blood pressure changed from 66/23 to 60/30 mmHg after ligation. Electrocardiography showed no ischemic changes. Transesophageal echocardiography showed a tiny amount of residual flow between the fistula and RV. Balloon atrial septostomy was performed at 4 days old, and a 3.5-mm modified right Blalock Taussig shunt was placed at 61 days old. At 4 months of age, she is doing well and waiting for a bidirectional cavopulmonary shunt. 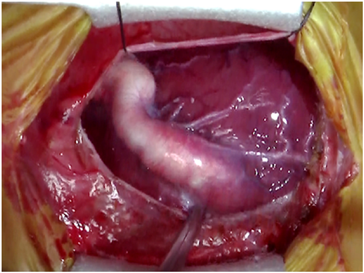 We prenatally identified a huge ventriculocoronary fistula associated with PAIVS, and successfully performed surgical ligation to prevent fetal myocardial ischemia.